Indianapolis - New parking meters and probably higher fees are ahead for downtown Indianapolis and Broad Ripple. Like the Indiana Toll Road and city golf courses, parking in the city is already privatized. But Mayor Greg Ballard plans to revamp the whole system. Michael Huber, who heads the Mayor's Office of Enterprise Development, said the requests for qualifications will go out next week. Huber said every parking space the city owns will be put up for bid, including the lots at Lucas Oil stadium. "What citizens can expect to see is a long-term agreement with an operator that covers meters, some garages and city lots downtown," said Huber. While Huber declined to define "long-term," he said "it will be long enough [for the operator] to recover the investment to improve the meters." The lease would require the winning bidder to pay $5,000-to-$6,000 apiece for new, high-tech meters, similar to those at White River State Park. Huber said the new meters would not only take credit cards by "smart" or prepaid cards that could be used at all city-owned meters, lots and garages. He said the goal of a lease is to make parking easier and more efficient while raising money for street and sidewalk improvements. Right now, meters pull in roughly $5 million a year, half of that from parking and half from fines. Chicago made $1.2 billion by leasing its meters for 75 years, but rates are now as high as $4.25 an hour which has irked residents and visitors to the Windy City. The privatization deal would have to be approved by the City-County Council. You can bet the deal will be in the range of 20-40 years to generate the sort of "tens of millions" Huber says the City would like to make. The deal though will leave the citizens of Indianapolis for decades to come at the mercy of a private vendor who will be much freer to raise parking rates than the City has been. Ask Chicago residents how well that has worked for them. Once again, this administration shows how completely clueless it is. Local Democrats are cataloguing each and every tax/fee increase proposed by the Ballard administration (and there have been many) with the plan to use those against Mayor Ballard and Council Republicans in 2011. Any Republican who believes the spin that these increases can be explained away to the voters or Democrats won't bother to use them in an election, is being foolish. 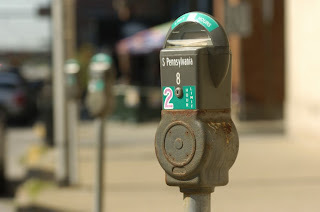 Note: Photo of parking meter from IBJ article last year: Privatize parking meters? Where's Amos Brown on this? Silent? Heck, not being able to drop some coins in the meter is most certainly putting 'his community' of poor people who can't get a credit card at a disavantage. "at the mercy of a private vendor who will be much freer to raise parking rates than the City" is a telling statement. I am surprised they have not yet gone to weekend and evening enforcement of parking meters. With the all the extra activity during those times, they lose quite a bit of revenue. Maybe they should do that instead of hiking rates. That's probably a better idea than hiking rates...at least better politically. I think this administration though gets a kick out of raising taxes/fees. It's so typical of Indianapolis, doing the exact wrong thing. Everyone avoids Downtown Indy, so Indy should be doing everything it can to draw people down there. Indy should be removing its parking meters, not further driving people out of the City. The metro area is called Carmel-Indy for a reason. Carmel long ago became the desirable center of the metro area. Every day, the message becomes clearer: stay out of Marion County. Are they going to privatize the homeless parking meters, too? Cato - no, but they are urging all well meaning people to stop putting money in them. This is ironic. Anyone who takes a class at IUPUI in the early evening (IE after 5-6pm) or does school work on campus knows how DEAD 90% of downtown is. Many of my favorite restaurants don't even consider staying open past 4 because they know no one will come around. And the few areas of downtown that do get foot traffic in the evenings and weekends (Mass Ave, South Meridian, possibly the circle) don't have enough parking to accommodate the mild demands. Well, at least this'll drive some people away so more of downtown can turn into the City Market after the workday is over. Mr. Mayor, the system is NOT broken. Don't try to fix it. Let me rephrase what I wrote. Downtown public parking certainly is broken, but it doesn't need this kind of fixing. Sometimes doing nothing is actually better, and this is one of those times. Okay, Cato, you lost me when you said Carmel was "desirable." I avoid Carmel because of the bad traffic and nutty police force up there that targets out of towners. In the context of the metro area, Carmel is by far the best option. Cato, perhaps if you like big spending Republican mayors who act like Demcorats. Carmelites will pay dearly for Brainard's reckless spending. I'd pick Zionsville over Carmel any day of the week. I'll buy Z-ville, Paul. Kinda splitting hairs, though. North of 96th is what matters.